You may be familiar with an old market saying: "Don't Fight the Fed." 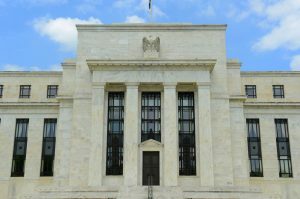 Since the Federal Reserve bumped interest rates higher at its meeting today – tugging the fed funds rate to 1.75-2.00% - it's valuable to consider the true meaning of that statement. "Don't fight the Fed" is a recommendation to stock investors to "pare back" on stock holdings as the central bank pushes interest rates higher. Why? The Fed hikes interest rates toward the end of a business cycle to prevent overheating (inflation). Historically, that precedes a bear market in stocks and a recession in the economy. Essentially – Don't Fight the Fed is a warning to stock investors – get out while the going is good! That may be truer than ever today! The current U.S. economic expansion cycle turned 9 years old in May. That is the second-longest expansion going back to the 1960's. But, interest rates are going higher isn't that bad for gold? Nope. Not now. Here's why. There are extremely low odds the Fed will truly be able to "normalize" its monetary policy before the next recession hits. Interest rates have been historically low for a DECADE now – since the 2008 global financial crisis. There is nothing normal about these conditions. Higher interest rates are bad for stocks (it makes everything companies buy on credit cost more). When stocks turn down, history shows time and time again, that gold prices turn up – usually significantly. Gold climbed 179% from the 2008 low into the 2011 high. We are getting close to the tipping point in that cycle now. Don't Fight the Fed means a bear market and recession could be just around the corner. This is a rare opportunity to accumulate gold – perhaps one of the safest assets known to mankind at a relative bargain price. Buying gold coins and bars is one of the best way to protect your assets at this point in the business cycle. The Fed is making moves. Are you? Call Blanchard today at 1-800-880-4653 to take steps to protect your assets.